One of the great genres of the late 60’s and early 70’s rock music scene was the Rock Opera, an album devoted to a story or a theme. Maybe the best known example was The Who with Tommy, but to me, Tommy was an over the top theatrical disaster, I watched an early version of it only a few days ago. The Nice had The Five Bridges Suite, ELP took on Mussorgsky’s Pictures At An Exhibition. Oh, I could go on and on with list, the Wakeman family are still doing it, son Oliver was involved with Clive Nolan on an epic Caamora theatrical event last year! What did most of these rock opera’s lack? In my mind, they lacked a coherent story. About the only example I can cite that did not fall into this trap was Jeff Wayne and his War Of The Worlds extravaganza. Then along comes Ken Hensley, oh, this is no rock opera, there is no theatrics, it is just an album that tells a coherent story. Alas it is an all too common theme. Rock star makes it big, Rock Star becomes an island in his own mind, Rock Star crashes hard, can Rock Star recover? This album is so well done, every track leads onto the next. Every track has been carefully crafted, and every track has a story to tell. Dwelling or even visiting the past is hard. It was a rule I vowed I would never break, yet I have. There is something masochistic about the journey, yet it is a powerful drug, a drug that takes people to High School Reunions, or to drive by the house they grew up in. Rarely does any good come of revisiting the past. The past is what it was! The house you grew up in turns out to be smaller than you remember, the friends you had have long since moved away. It is a journey into misery. Ken Hensley takes us on the journey of his life, and does it with truthfulness and panache. Who is Ken? Ken was one of the founding fathers of Uriah Heap, a great, and hugely successful 70’s English prog rock band. On this adventure he is joined by bass player and songwriter Glen Hughes, who is likely best known for his time with Deep Purple. Jorn Lande may not have the long resume of Ken and Glen, but he fits right into this line up. John Lawton and Eve Gallagher round out the band. So lets take a critical look at Blood On the Highway. This something I normally do not do. But this CD is so good, I can not resist, I have spent too long as a reviewer not to! Kicking off we have (This Is) Just The Beginning. This very much is an exploration of the rock scene, should you do it, should you not? Track two, We’re On Our Way explores those first early faltering steps. Blood On The Highway takes a long hard look at life as success seems to come from hard work and maybe some lost friendships. You’ve Got It (The American Dream), for many musicians America in the 70’s represented the nirvana for successful musicians, to break into the American market was all! The English music scene had disintegrated into something that I don’t even like to remember. The major bands of the time could not wait to leave. My favorite quote comes from Al Stewart â€œI went on tour in the US, and I just stayed on Tourâ€. It is at this point that most musicians think that they have it made. They have arrived! But the American dream is a tenuous one. The radio business was in a process of change, consolidations, changing values, and maybe a changing format rang the Death Knell for many people. Even worse, many musicians did not even understand the change. Maybe the biggest issue was the record labels, it didn’t matter that you were selling a million albums. You were still getting 5 cents on the dollar, oh you want to tour? No problem ‘we will front the money’. In the course of the excitement, few musicians realized what was going on, they were working for minimum wage, actually far less than that. Many bands ceased ‘to be’ when they got the bills. It Won’t Last takes a look at the end of the good times. I could go on and on about this great album. It is so well done. It is a work of art. And it should be on every musicians must listen to list. I have only touched on the start of this work of art. The second half explores the concept of going solo, the huge crash and burn, and a gentle return to the harsh reality of life. Ken Hensley has put this part of behind him. The future looks bright, very bright indeed. To quote the last line of the last track â€œ But I’m ready now for one more bow, I’ll take the last danceâ€. I do not have a star system for my reviews, but if I did, this one would get 6 stars out of 5! Not only is the music top notch, the message is haunting. Ken, I salute you for putting this album together. If you have not already got this one in your collection order it from Amazon or better still, go down to your local music store (if such a thing exists anymore) and demand that they get it in stock! 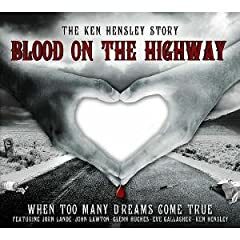 1 user commented in " CD Review: Blood On The Highway â€“ When Too Many Dreams Come True by Ken Hensley "